Protein is something you need to eat almost every day. Why? Because your body doesn’t store it the way it stores fats and carbs — the other two main “macronutrients” in food. OK, but what is protein? 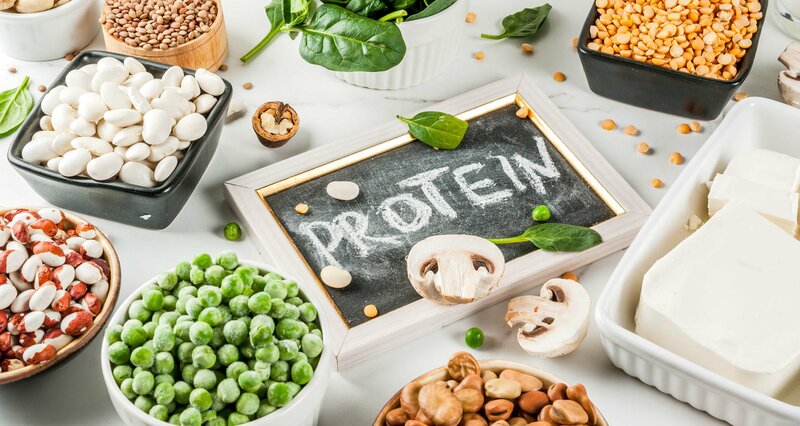 Protein is an essential nutrient for the building, maintenance, and repair of almost all the tissues in your body, including your bones, muscles, blood, hair, nails, and organs. Protein also gives your body energy, although that’s not its main role. In addition, protein helps keep your immune system strong (because your immune system is made up of proteins), and eating protein can help keep you feeling full longer. What we call protein is made up of 21 amino acids. Your body can make 12 of them, but there are nine that are called the “essential” amino acids because you need to get them directly from your food. As long as you’re eating a variety of whole, natural foods and getting enough total calories and enough overall protein, you should meet your needs for all nine essential amino acids. The notion that you need to combine foods in order to get the right balance of amino acids is, essentially, a myth. In the U.S., the official recommended daily allowance of protein is 0.36 grams of protein for every pound of body weight. That means, at 150 pounds, you’d need about 54 grams of protein per day to meet this target. If you’re an athlete who is trying to build muscle, if you’re pregnant or lactating, or if you’re under exceptional emotional stress, the recommendation is to get at least 0.45 grams of protein daily per pound of body weight (which means, at 150 pounds, you’d need about 67.5 grams of protein daily). New research is finding that older adults tend not to absorb protein as efficiently, so seniors may need more of it. 1. Find your “P” value. Seniors ages 65+ and special needs = 0.44 to 0.522. *=Based on the available research, these suggestions are intended for general health, disease prevention, and longevity. But for specific contexts, such as power athletes and weightlifters, there is also research showing that higher protein intakes may be advisable in some instances. Also, we are each biochemically and metabolically unique, so listen to your body, use your own best judgment and, wherever applicable, consult with your healthcare professional for guidance. What If You Want More Protein? If you want to boost your protein levels, you might consider using shelled seeds (hemp, flax, and chia seeds are excellent), or seeds that have been ground into a powder, so you get all the benefits of the whole foods. What about more refined protein supplements? That may not be the best idea. In 2018, the Clean Label Project tested the most popular protein powders on the market. They found that virtually all of the 134 protein powder products tested contained detectable levels of at least one heavy metal, and 55% tested positive for BPA. Strangely, the plant-based and organic protein powders were not exempt from these problems — and in many cases actually fared worse. According to 2014 research from The NPD Group, almost 80% of U.S. consumers say they want more protein in their diet. But do they need it? This may come as a surprise, but protein deficiency is virtually nonexistent in industrialized countries. Most American adults eat substantially more than the recommended amount — averaging more than 100 grams of protein per day. And most Europeans get more than they need, too. If you’re eating enough food, so you don’t lose weight, and you’re eating a variety of whole foods, it’s almost impossible to consume too little protein. In general, the only people who are truly deficient in protein are those who aren’t eating enough calories — which is a serious and potentially life-threatening concern for hundreds of millions of people on the planet who don’t have enough food to eat. Protein deficiency can also become a problem for “junk food vegans” who eat no animal products and a lot of processed foods. There’s no protein in sugar or bottled oils and very little in fries or chips. And protein deficiency can also be a problem for alcoholics, people with eating disorders such as anorexia, and addicts — all of whom tend to have diets that are deficient in many important nutrients. But with these exceptions, in the industrialized world, where starvation is relatively rare, inadequate protein consumption is almost unheard of. If you eat 2,400 calories in a day and 15% of your calories are coming from protein, you’ll be eating 90 grams of protein. In fact, as surprising as it may sound, we’re beginning to understand that far more people may be suffering from getting too much protein, than suffering from getting too little. When you consume more protein than your body needs, it doesn’t store as protein. Instead, it’s converted to fat or eliminated through your kidneys, which contributes to osteoporosis and kidney stones. And that’s not the only problem too much protein can cause. When the International Scholarly Research Network published a meta-analysis of 31 studies on protein intake and disease, it concluded that overconsumption of protein was associated with higher rates of cancer, osteoporosis, renal disease, disorders of liver function, and coronary artery disease. In some of the most important nutritional research conducted in recent years, Valter Longo, PhD, director of the Longevity Institute at the University of Southern California, and his team published a study in Cell Metabolism in 2014, that tracked 6,381 adults over the age of 50 for nearly 20 years. The study found that between the ages of 50 and 65, participants who ate a high-protein diet (defined as 20% or more of calories coming from protein) were four times more likely to die of cancer than those who consumed a low-protein diet (with less than 10% of calories coming from protein). The increase in cancer risk associated with a high-protein diet during these years was on par with smoking 20 cigarettes per day! A high-protein diet — particularly if the proteins are derived from animals — is nearly as bad as smoking for your health. Once over the age of 65, however, cancer mortality data leveled off, indicating that for people over age 65, there is no meaningful cancer-fighting benefit to a low-protein diet. At each age, however, those participants who ate a high-protein diet had a five times greater risk of mortality from diabetes. Overall, the study found that people with a high-protein diet were 74% more likely to die of any cause within the 20-year study period than their low-protein counterparts. What if we’ve had it all backward? Is it really possible that most of us are actually getting too much protein? However, according to the study’s findings, the negative health associations of a high-protein intake were reduced or eliminated if the proteins came from plants, which leads us to the next point: Not all protein is equal. 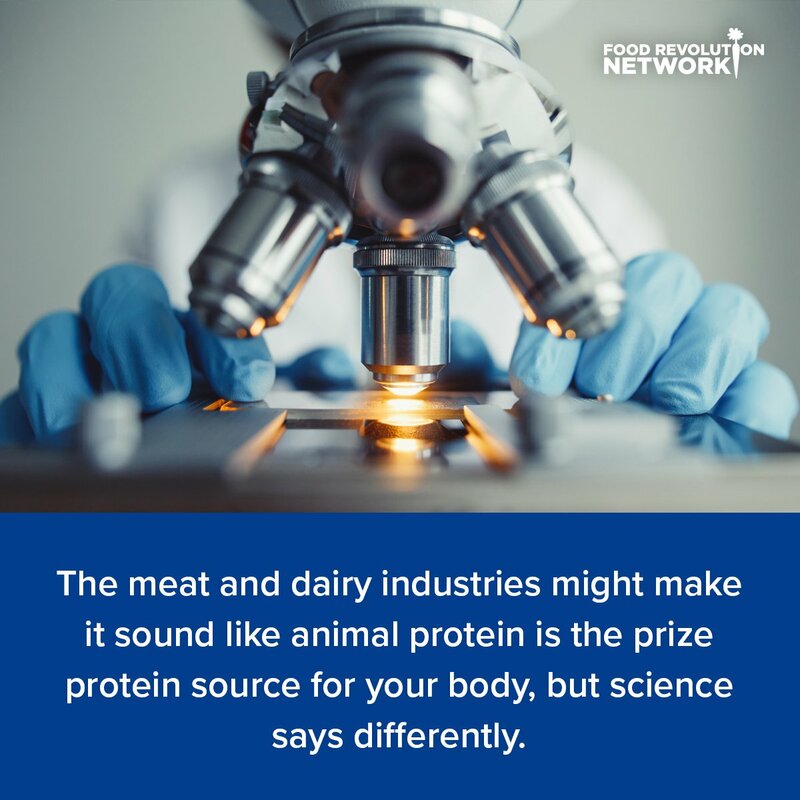 Although the meat and dairy industries like to make it sound like animal protein is the prize protein for your body, science doesn’t back up this claim. It turns out that the source of your protein matters and that animal protein may actually be significantly inferior. In a 2018 study published in the International Journal of Epidemiology, researchers followed 81,337 participants for six to 12 years. The researchers looked at the percentage of protein that came from animal and plant sources for these participants. What they found was that the risk of cardiovascular deaths steadily climbed with higher consumption of meat protein — but fell steadily with increased consumption of protein from nuts and seeds. In addition, a 2003 research review published in The American Journal of Clinical Nutrition confirmed that diets lower in meat consumption lead to greater longevity. The researchers also noted that the longer a person’s adherence to a plant-strong diet, the lower their risk of mortality and the higher their life expectancy. At least one of the reasons may be the protein IGF-1. Research suggests that animal protein, in particular, causes higher levels of IGF-1, which may increase your risk of cancer and many age-related diseases. Does Protein Make You Lean and Strong? The right amount of protein will help you be healthy, but what about the claims that extra protein intake allows you to release extra weight and is needed to build muscle? In fact, the only way to build muscle is through exercise. Your body needs enough protein to function, and weightlifters and power athletes may need more than everyone else. But consuming excess protein by itself won’t give you strength. For weight loss, it’s true that protein can help reduce hunger, boost metabolism, and reduce cravings. But too much protein has too many health downsides to be a desirable weight loss strategy. 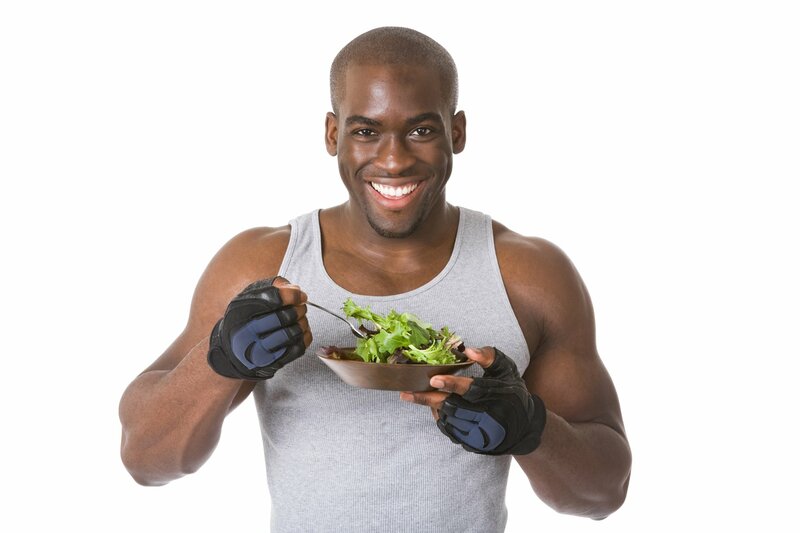 There is a widespread belief that only animal foods provide sufficient complete protein. But the reality is, many plant-based protein food sources contain abundant and complete protein. For example, the percentage of calories coming from protein in tempeh, tofu, or green lentils is actually higher than in bacon or in cow’s milk. This fermented soy food has loads of protein. Try it as a substitute for bacon on a BLT, chopped up on a tasty salad, or in a stir-fry with some colorful veggies. Tempeh also makes a great addition to chili. Lentils are a delicious addition to many meals, and at an average of $2.00 per pound, they’re highly affordable, too! Try red, green, brown, yellow, or black lentils — and add them to a Buddha bowl, make lentil soup, or incorporate them into burritos or tacos. This Asian staple is soy in its most natural state. And it can be quite addictive (in a good way!). Eat edamame out of the shell, wrapped up in summer rolls, or as a regular in your salad rotation. Also known as garbanzo beans, chickpeas are highly satiating. They’re also the main ingredient in one of my favorite spreads: hummus. Try making your own hummus. Or add chickpeas to salads, bowls, or roast them for a crispy, on-the-go treat. 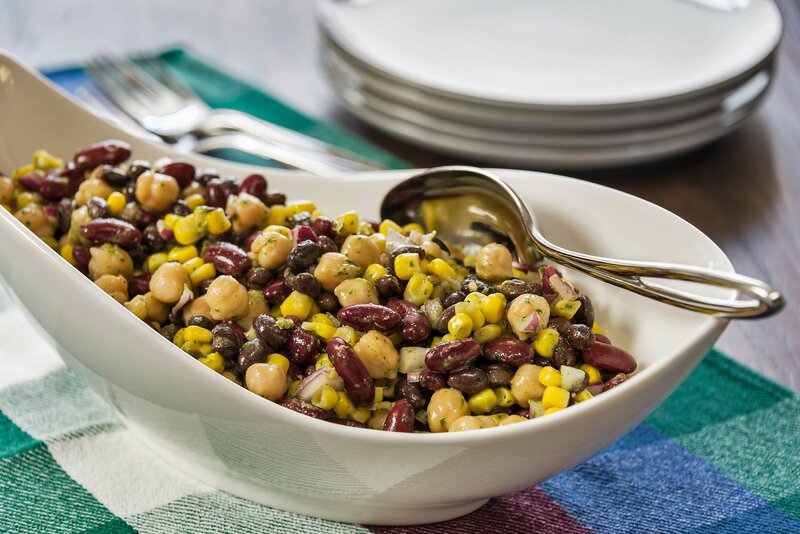 Chow down on these protein-rich beans any time of the day. Combine them with whole grains for a protein-packed combo, turn them into a spread, or whip them up into a nourishing soup. 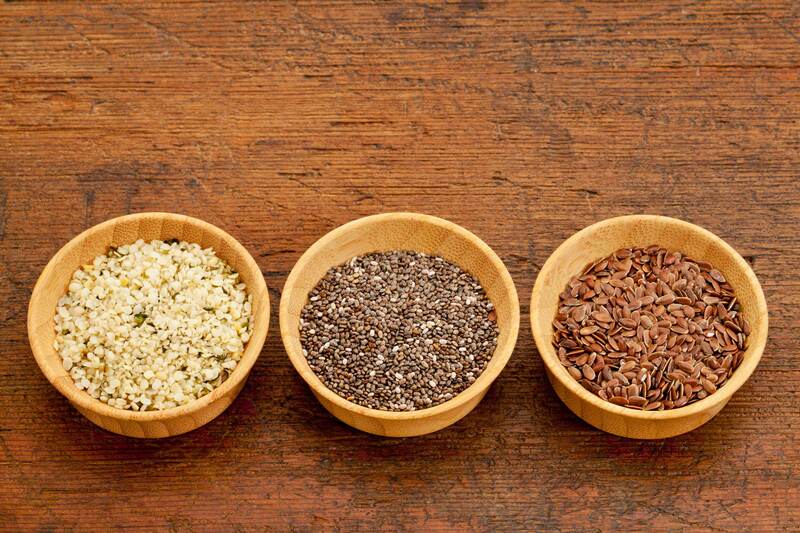 These tiny little seeds pack a powerful dietary punch; they’re rich in protein as well as omega-3 fatty acids. Small but mighty, they make a great addition to smoothies, bowls, or sprinkled on salads. Instead of adding protein powder to your smoothies, add a scoop of hemp seeds. Try quinoa instead of rice in plant-based sushi with this recipe from Lazy Cat Kitchen, use it as a base for bowls, or even make a Crustless Quinoa Quiche. If you’re not a fan of tofu — you probably just haven’t found your favorite way to eat it. The possibilities are almost endless with this ancient staple. 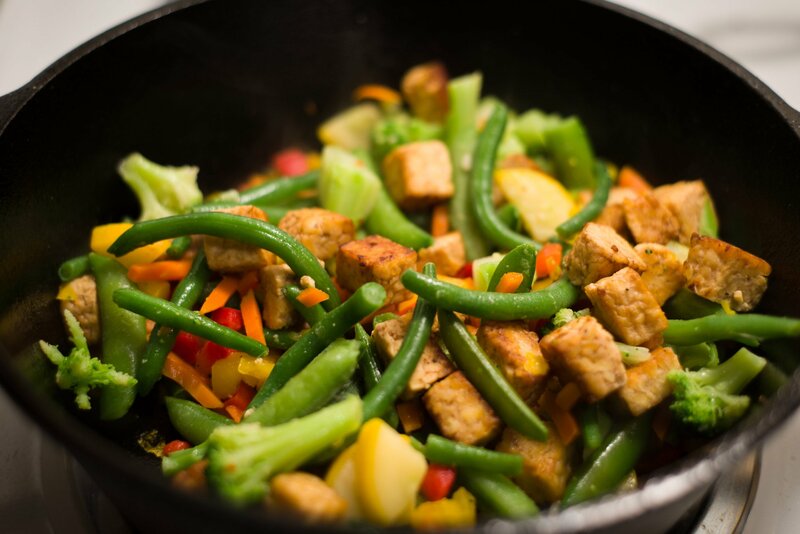 Try the extra-firm variety in stir-fries, marinate it in your favorite sauce, bake it, or plop it in a soup. A perfect on-the-go snack, almonds are high in healthy fats and other good-for-you ingredients, including fiber, magnesium, and vitamin B2. Eat almonds on their own or smother almond butter on sandwiches or apples. You can also chop them up and add them as a crunchy addition to your favorite dish. These little seeds have superpowers! Try them on their own, sprinkled on salads or zoodle dishes, or even made into a Sunflower Seed Butter via this recipe from Minimalist Baker. Not just for breakfast anymore, oatmeal can be included in so many recipes (they even make milk with it now!). Make some overnight oats with this recipe from Cookie and Kate, try this Savory Oatmeal from Forks Over Knives, throw some into your smoothie, or make oat waffles. 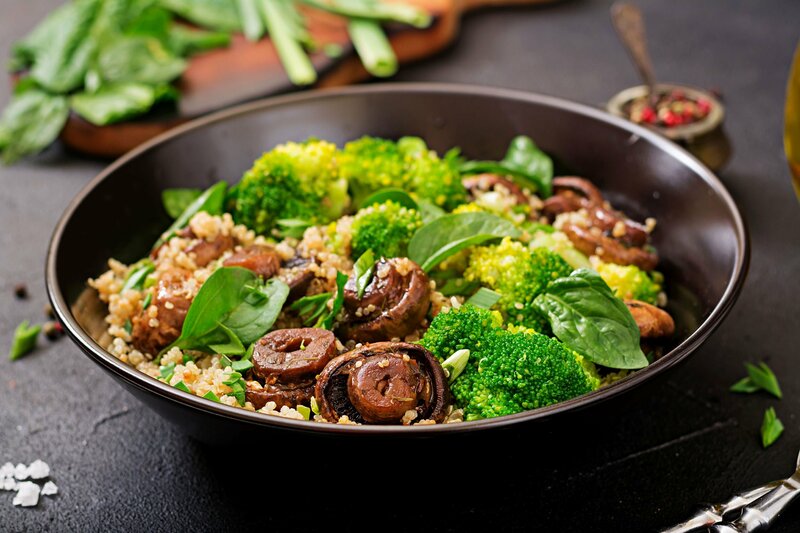 Broccoli is a healthy cruciferous vegetable — and also a surprisingly good source of protein. Add it to salads, make it into soup, saute it, or add it to quinoa for a protein-packed dish. Ch-ch-ch-chia! Sound familiar? For many folks, their only experience with chia seeds growing up may have been via the infamous Chia Pets. But these teeny little seeds are now becoming an increasingly popular superfood because of their high protein, fiber, and omega-3 fatty acid content. Make a chia seed pudding, use chia seeds in smoothies, or add them to salads and oatmeal. And here’s an important tip: Like flaxseed, it’s best to grind your chia seeds to get the most nutrients possible. For many people, roasting fresh pumpkin seeds from a jack-o’-lantern is a fun (and delicious) fall activity. But even if it’s off-season, you can buy these hearty seeds (also known as “pepitas”) almost anywhere. Eat them as a snack when you travel or throw them on top of salads and bowls. You can also whip pumpkin seeds into hummus. Protein is essential for your body. But if you want to stay well and avoid disease, it’s best to source most of your protein from plants. Luckily, the plant kingdom doesn’t make that hard to do. You can get the protein you need from a variety of garden-grown goodness every day. Editor’s note: This article is a partial adaptation from Ocean Robbins’ forthcoming book, 31-Day Food Revolution: Heal Your Body, Feel Great, & Transform Your World (Grand Central Life & Style, February 5, 2019). Order your advance copy here today! Does this change the way you think about protein? What are your favorite protein sources? Though most of us get enough protein, many people don’t get enough fiber. Learn why fiber is good for you and how to get enough.